Since upgrading my main iMac to High Sierra I’ve noticed that the Aluminium Apple remote I use to control iTunes and Kodi is no longer working as expected. I tend to use the Candelair alternative driver for my remote as it’s better at making the remote play nicely with Kodi, but I’ve found even using the Candelair driver is causing issues. The remote works for left and right but the up & down function isn’t working. This seems to be connected with the core High Sierra driver which is now using the up and down functions for volume control even when using Candelair. *A fix has been issued for Kodi, if you download this experimental High Sierra remote fix version, install and reboot your mac you should regain apple remote functionality, at least within Kodi. This issue is driving me mad with Kodi as the remote is now essentially useless. I’m working on a fix and pulling a few things apart in the OS to see if I can figure out what is going on. It doesn’t help that the official Kodi forums seem to be ruined after a ruined MyBB upgrade so I can’t hop onto the forum to discuss with other High Sierra or Kodi users. The fact that the apple remote isn;t working with high sierra is quite a big issue for my daily workflow as I control Kodi with the remote while working. As a stopgap, I’m using the Kodi remote app on my iPhone to control Kodi. It works, but means I have to be looking down at my phone & then up at the Mac. I miss how simple & intuitive the apple remote is for controlling Kodi, but until a high sierra remote fix is complete I’ll have to make do with a software remote. If you have found a fix, leave a comment below & I can try it out and update this post as necessary. If you would like to try the Candelair driver, you can download the preference pane for free on their website. I’ve always been a fan of RSS readers. Right back when XML was starting out and RSS feeds became the norm on blogs & websites, I would use an RSS reader to aggregate the posts from my favourite sites & blogs. 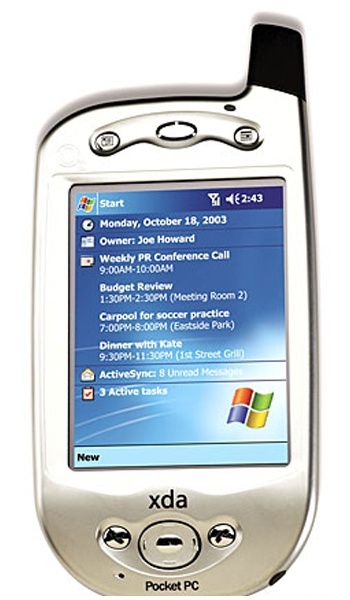 Back then I’d access them for offline viewing on my palm pilot or O2 XDA (well before smart phones we had palm tops such as the XDA and companies like Palm who provided me with the Palm IIIc where huge). The advantage of RSS was the fact that posts could be pulled in from loads of different sources, without the need to go checking each individual site. For people like me, who are obsessed with the latest information, this was a game changer. Also, back then, most RSS feeds consisted off the full text of the article, including pictures, making it easy to aggregate blog posts and news posts for viewing offline. This was the days of extremely limited GPRS access which was extremely slow & costly. So syncing for offline viewing was the norm. Then came iPhones, smartphones, tablets and smart watches. All relying on a 3G or 4G signal and constantly connected to the internet. People stopped syncing content to their devices and started relying on mobile connectivity. For many reasons, this was the prefered business model for all hardware and software vendors. It meant services like Spotify could rent music to you without ownership ever being offered. People could stream from Netflix and Amazon prime without ever owning their content. The media software companies had a lucrative never-ending revenue stream and the mobile network vendors had endless data usage to keep them in cash. Nirvana for those who would rather lease content than own it. Having been born in the early eighties & being interested in tech since the ZX spectrum, I’ve always approached things differently. I prefer ownership, I really dislike streaming anywhere other than on a solid broadband connection, I like to have content which is available offline. I travel a lot, I like my MP3’s to be stored on my iPod, my ebooks stored on my kindle and my laptop to be stuffed with movies that are available offline. I like ownership of my content. No chance of changing terms and conditions, and access anywhere on the planet regardless of connectivity. So we bring it back to RSS. With my web content I’d moved more towards the Spotify model. I would visit websites as & when I remembered, but I’d only have access to that content while online, so often I failed to even check websites from one month to the next. I forgot about many of the gems I used to read daily with RSS. The blog posts I’d read on my XDA or my Palm IIIc while traveling (because the wider internet & social media weren’t available on the go, so I’d actually read real in-depth content). I had become a 140 character junkie, only ever reading a synopsis or an extract. I became aware of a lot of subjects but an expert in non of them. It was time to find a new RSS reader & start reading full length content again. I searched high & low for a decent RSS reader & I finally settled on Reeder for OSX and OS Sierra. I also have the same app for my iPhone, but I’ll review that separately. 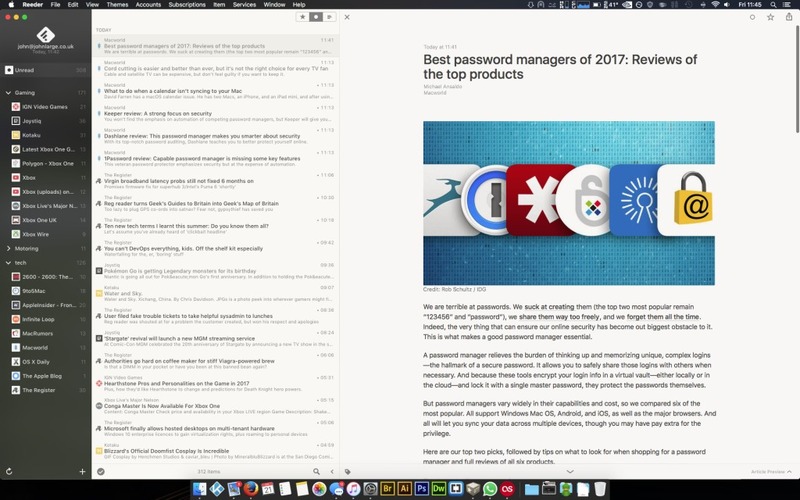 Reeder is a fully featured RSS reader. It can show standard RSS feeds, but it can also download full articles, even when the RSS feed is extract only. I guess it does this by visiting the websites canonical link and downloading the full article. 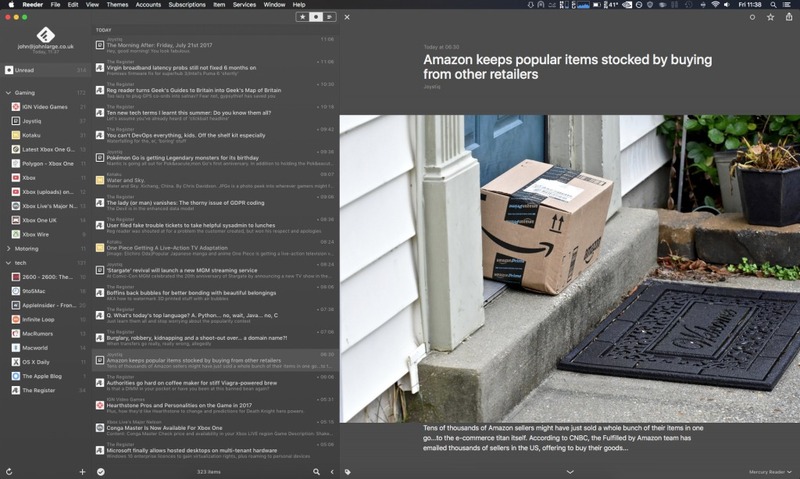 Reeder displays your RSS feeds much like an email client. You get all of your post titles/headlines in the left pane and you get the article text in the right pane. 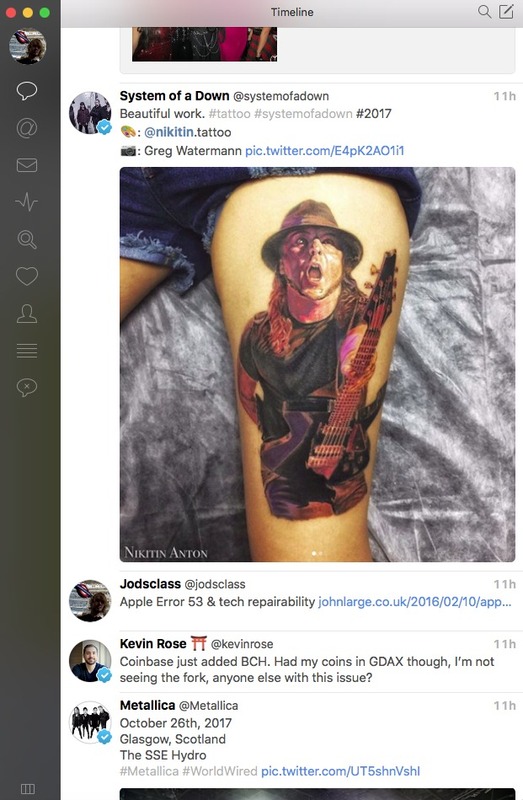 The advantage of an RSS reader like Reeder is that it strips out formatting and presents text in an easy to read format, complete with pictures. It does strip out adverts from content which can be a plus, especially when saving bandwidth & from a privacy standpoint. 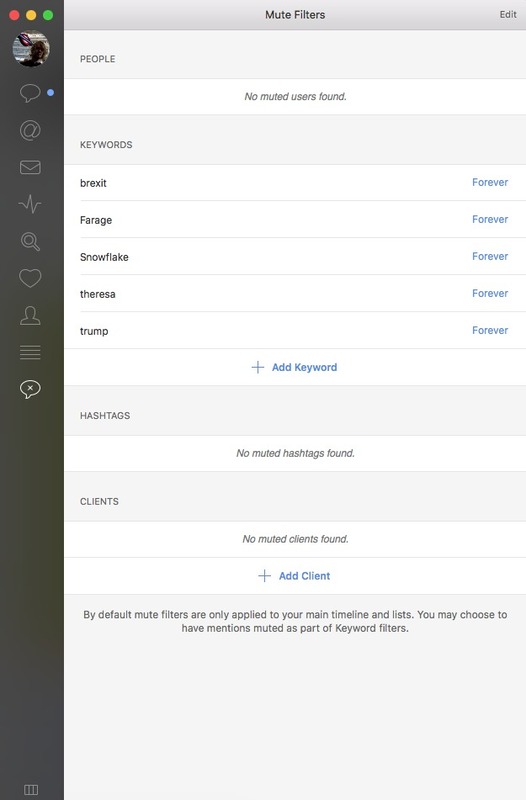 With regards features, one of the features I most use is the integration with Feedly. To save me setting up my RSS feeds on every machine I use, I setup a free feedly account and added all of my RSS feeds to the one account. 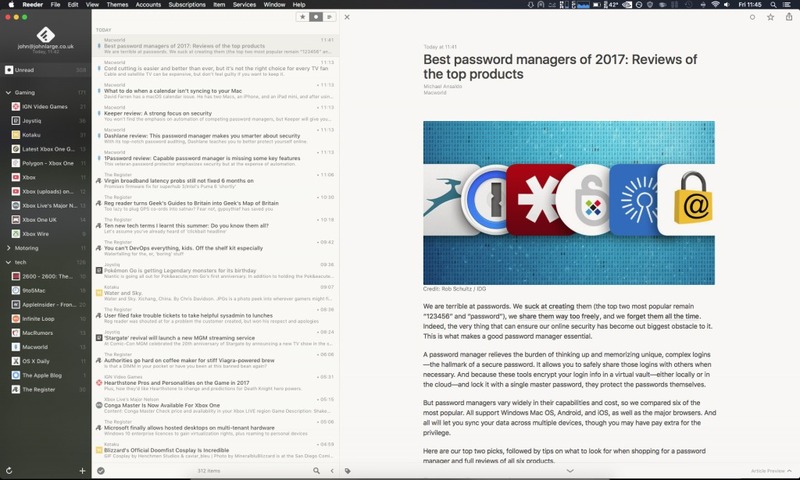 Then, using your feedly credentials in Reeder, you can sync your feedly account and view all of your RSS feeds in the reeder app. Reeder downloads all of your RSS articles for offline viewing & can be set to sync at intervals of your choice. 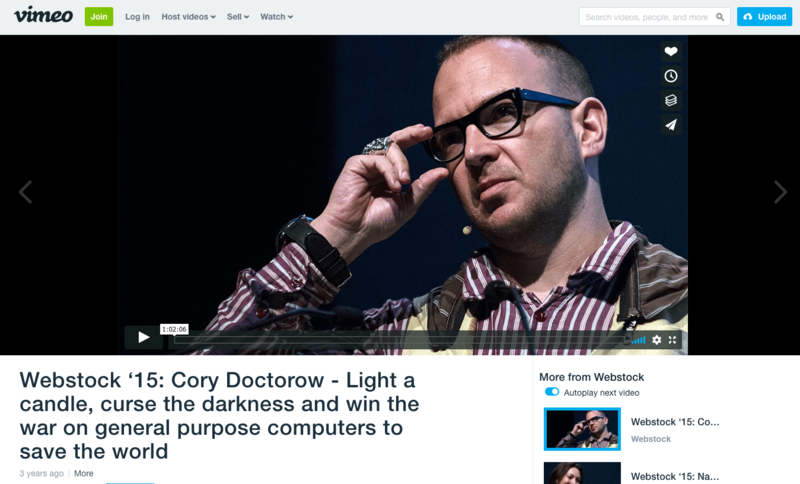 Articles can be set to disappear when read, enabling you to concentrate on fresh content. The built-in mercury reader is ideal for displaying richer full text articles & the reading themes, much like you get in an e-book app or within a reading extension like reader view in Firefox allow you to set the page and text colour and adjust font size and style for easier reading. I find a larger font on a black background allows me to read a lot of content without fatigue. I do like the formatting controls available. The benefit of RSS is that I don’t have to remember to check websites for new articles. The content is aggregated, sorted and formatted for me to read. I rarely miss an important story in my field now & I’m generally more informed than I have been for years. I always relied on RSS during my university studies to stay current and at the bleeding edge. I’m disappointed that I let this habit of reading RSS be replaced by individual apps and a generally bloated reading experience & would recommend RSS to anyone wanting to regain control of their informative content. Reeder has a ton of features which I’ve probably not even come across yet. My favourite so far is the Mercury reader. If an RSS feed is just a post extract, asking you to click to read more, simply pressing the G key on your keyboard will fetch the full text from the website & format it in seconds, without the need to visit the website. Reeder also has extensive sharing features, so if you are an influencer or expert on social media, it’s a great way to find & share relevant articles with your peers. 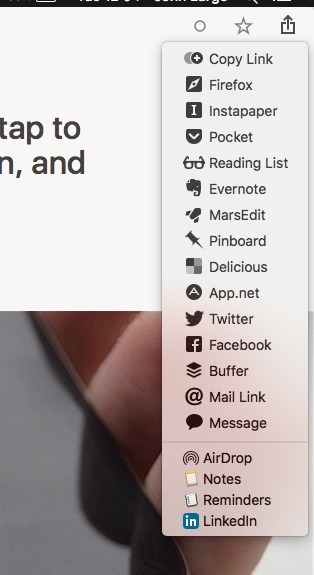 Sharing to services such as Evernote, Twitter, Facebook and Buffer are baked right into the application and allow you to share an article in seconds. Great for growing your online reputation as an influencer. 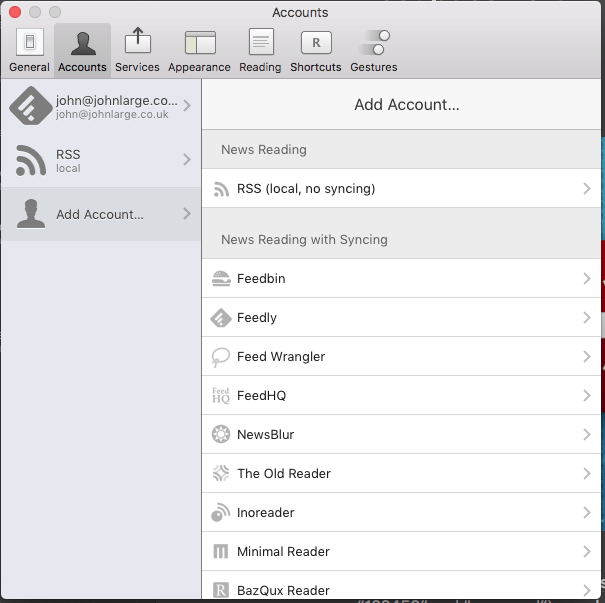 Reeder supports a lot of RSS feed services such as Feedly, Feedbin, feed wrangler and Feed HQ, and also allows integration into services such as Instapaper for read later functionality. If you prefer to manage your RSS feeds yourself, either for privacy or maybe you only use a single device, than you can add any RSS feed locally without the need for third-party support. Overall, Reeder has completely changed my information retrieval habits. It’s a flashback to 10 years ago for me as I’ve strayed more and more into individual apps for news and neglected a lot of the awesome blogs & news sites I used to frequently read through RSS. If you are new to RSS I highly recommend you check it out. 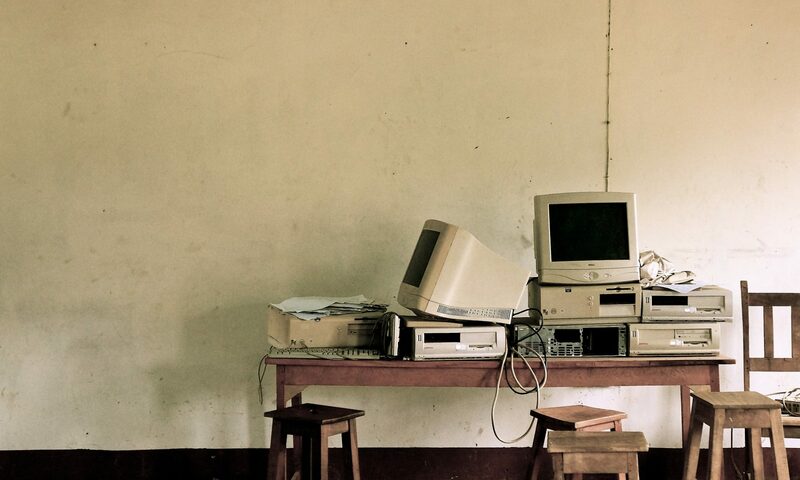 The modern web can mean we are bombarded with information. 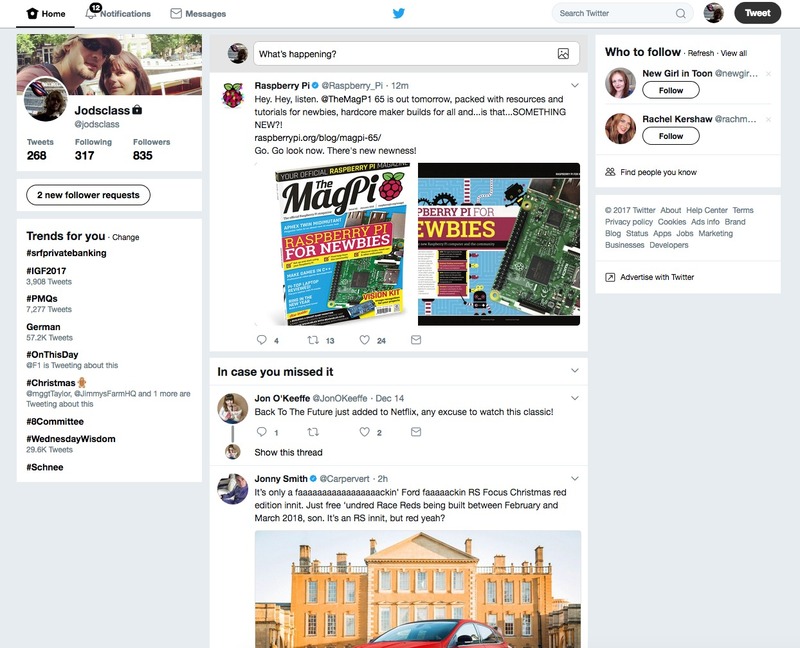 Information overload can lead to people switching off completely from website content and just sticking to their social feeds, but I guarantee if you find bloggers & websites who write about subjects you are passionate about, you will benefit greatly from reading full text articles over tweets and snippets. 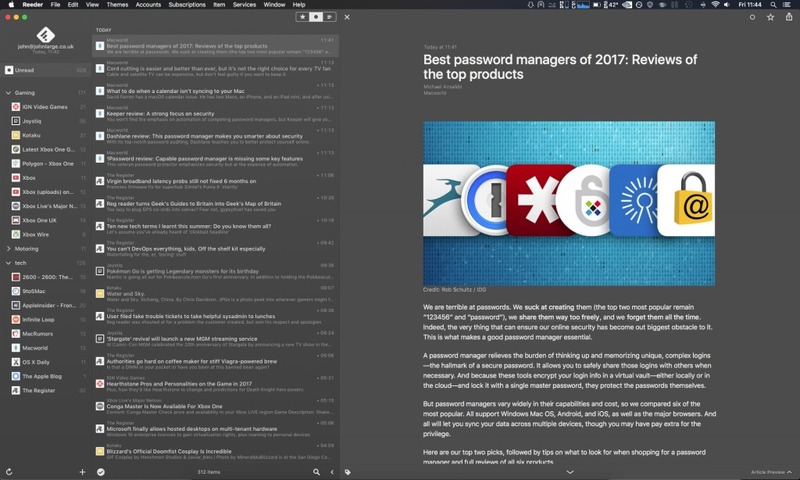 Reeder is the perfect choice for those already interest in RSS or those wanting to streamline their information consumption. Offline availability is vital to me. My feeds may provide 1000 articles a day, 100 of which I may read. Now that I can get them offline I can read them on the go. I can remain offline and read without distractions, I can catch up on them on the plane or train. If I’m delayed in an airport, I can read offline content rather than paying for overpriced wi-fi to access sub par apps and tweets. Please do check out this app. It is a premium product for Mac OS and does carry a £9.99 price tag in the apple app store for Mac OS, but it’s a worthy investment and will radically change how you consume information. Now some pictures of Reeder in use. As regular readers will know, I love my 5th Generation iPod video. I bought this iPod back in 2006 while on holiday in San Francisco & it has seen heavy usage daily since. The iPod has always been kept inside a protective hard case, a Belkin case, and generally well looked after. Over the years it has required a new Battery to be fitted which I did myself & also I’ve replaced the original 30GB hard drive with an iFlash Quad unit. The iFlash Quad allows the use of cheap Micro SD cards for storage & mine currently has 256GB worth. Over the last few months I’ve had a crackling over the headphones when playing music, which steadily got worse. And only a few weeks back I lost all audio. I was gutted! It turns out that the very reason I love this iPod, the wolfson DAC, was also the culprit. Over time, the audio chips de-solder from the logic board. This could be due to changes in temperature when using the iPod in hot conditions, such as in a car. I tried to reflow the logic board but to no avail. It was time for a new logic board. This iPod is now 11 years old & spare parts aren’t easy to come by. I managed to find a Canadian seller on eBay who had a refurbished iPod video 5th generation logic board for sale. The board was £55 delivered & took around 4 weeks to arrive after getting stopped at customs (without extra charges). Fitting a logic board into a 5th Generation isn’t for the faint of heart. 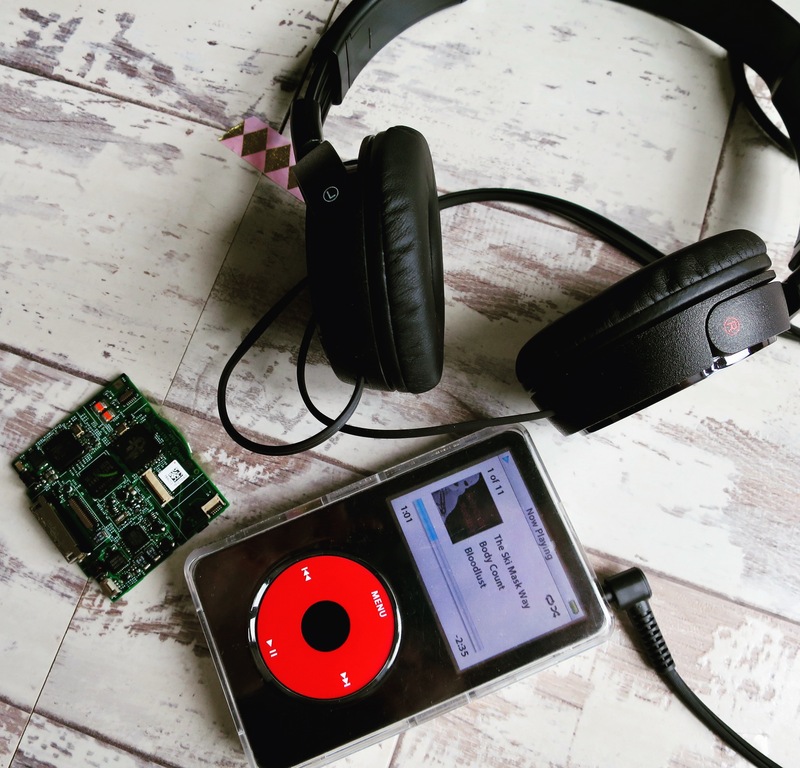 It requires stripping down the iPod into its component parts, including un-pealing ribbon cables which are attached with glue & completely dismantling the chassis. It’s not an impossible task if you take your time, and I’d advise you take pictures along the way to keep track of component & cable locations. Once I had the logic board in place I reassembled the iPod and plugged it into my iMac. I instantly had an issue. After restoring the iPod software in iTunes I found the iPod stuck in a reboot loop. The Apple logo would display on-screen, followed by the screen flashing and the iPod rebooting. This would happen indefinitely. At first I suspected a faulty logic board, but I managed to get the iPod into Disk Mode and the screen displayed fine & was recognised by the iMac. This demonstrated that the logic board was fine. I then entered the diagnostic secret menu on the iPod and ran some self tests. Again, all came back as normal. I suspected a formatting issue, so I plugged the iPod in to the iMac in disk mode & used Disk Utility on my mac to format the disk. After formatting the disk iTunes again wanted to restore the iPod, I let it do its thing & the iPod booted first time. This could have been an issue with iFlash quad, or it could be that the storage device is somehow paired to the logic board. Either way, formatting in Disk Mode using disk utility, then restoring in iTunes fixed the issue. I was happy to see my Ipod boot up quickly & I started to sync my entire library (over 140GB) over to the iPod. This takes a long time as the USB interface on these old iPods is slow. I let it sync overnight and came back to it the next day. As soon as I started scrolling through the menus it felt different. Only slightly, but I noticed a search option. To my surprise I had been sent the logic board from an iPod 5.5 generation. These where the last of the 5th Generation iPods, the last with the Wolfson DAC which is so sought after, and the one with many improvements. 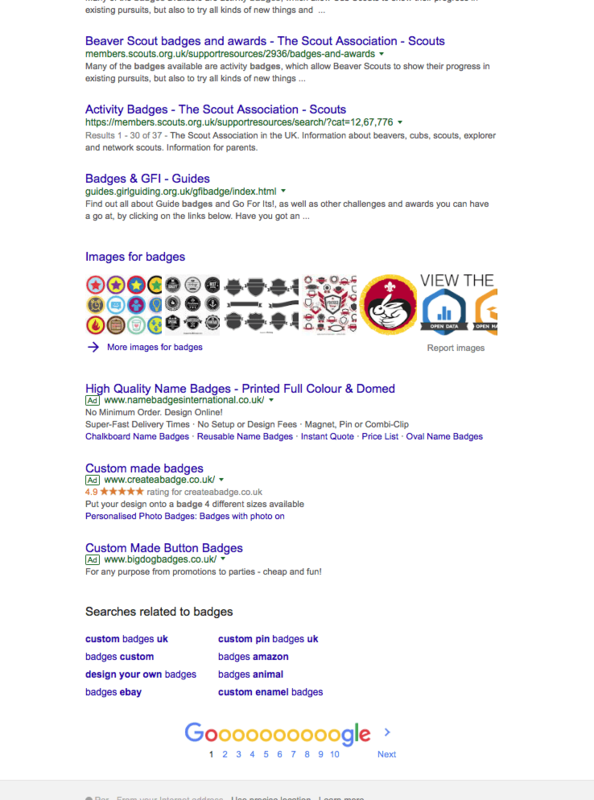 We now have search & brightness controls, and the menus feel snappier. This now means I’ve got a 5.5 Gen iPod with 256GB of flash storage and a fresh battery. Gone are the days of not carrying all of my music. No longer am I bound by 3G/4G signal for my music. This iPod is perfect for travel, ideal for the airplane. Last time I flew to Berlin when the iPod was broken, I only had my iPhone 6. To my dismay I only had 12 songs stored locally, which meant a long travel time with only a handful of tunes I hadn’t even chosen. I generally hate streaming over cellular. It’s unpredictable, costly & dependent on Signal. It also ruins battery life. I’m so glad to have my iPod up & running again & I can see me using this for another 10 years. If you have a 5th Generation iPod & still use it, let me know in the comments. I started searching online for a solution and there seemed to be solutions for loads of older versions, but nothing about the current 3.0.3 plugin. 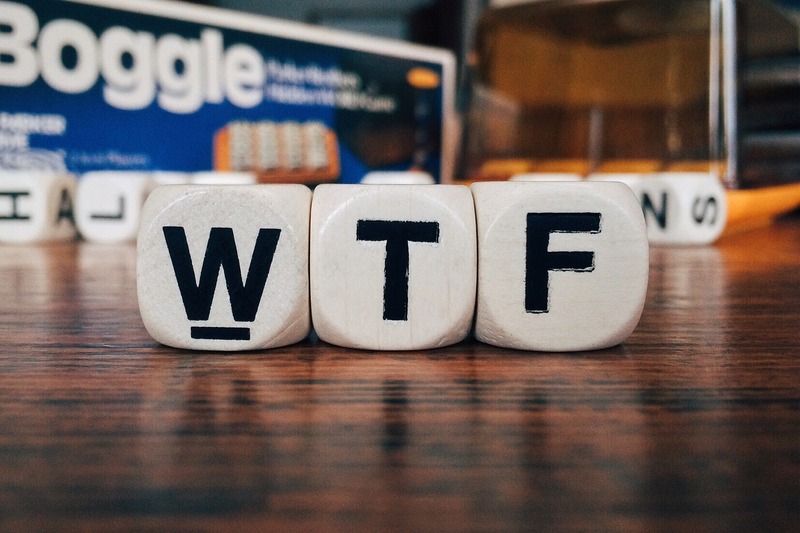 After successfully getting the plugin to run on various other copies of wordpress on the same server I started to look at the config of the problematic blog. The only thing that differs on this site, compared to my others, is the level of security I have set. I quickly discovered that the All In One security plugin (also known as WP security) was stopping the Cloudflare settings page from loading. Simply disabling the WP All In One Security plugin allowed me to load the cloudflare wordpress plugin and get around the blank grey settings screen. 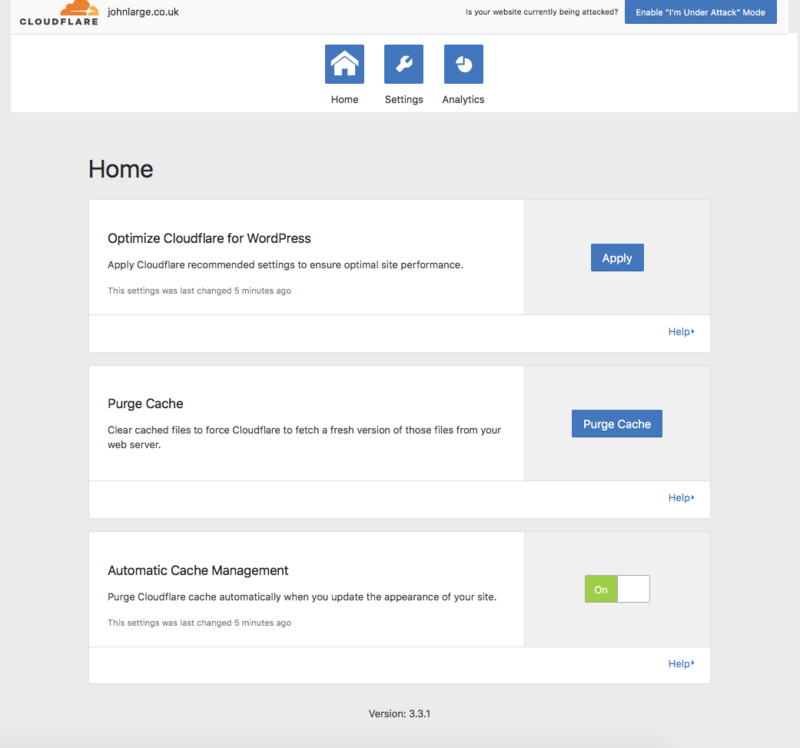 I can now configure wordpress without any issues to use Cloudflare. Once I set all of the API settings in the cloudflare plugin I reactivated the WP All In One security plugin and had it reinsert all of my .htaccess rules. surprisingly, the Cloudlfare plugin now plays nicely with the WP All In One Security plugin and I can get on with my day. If you are having issues with a blank settings page using the cloudflare plugin with wordpress, have a look at your security plugins & disable one at a time until you are able to enter your API credentials. Then re-enable and hopefully you can carry on with your blogging. Hope this works for you. Please do let me know if it does. GPG is important for emails as it means that an email remains encrypted between the sender & the receiver. It works on the principle of key pairs. Each user generates a pair of keys, one private key remains secret and on the user’s computer, the other, known as a public key is free to distribute on the internet and allows you to pass it on to those you wish to communicate with. It is important that your private (secret) key always remains private & you never share it with anyone. The keys are paired so that both are required to encrypt & decrypt emails. I won’t go into the technicals of it, if you are interested there are a lot of free resources which will guide you through the technology. Encryption also requires a password to be set when creating your key pair. This password allows you to unlock your keys & use them to encrypt your email. Both sender & receiver need to set up a keypair & share their public keys with each other. 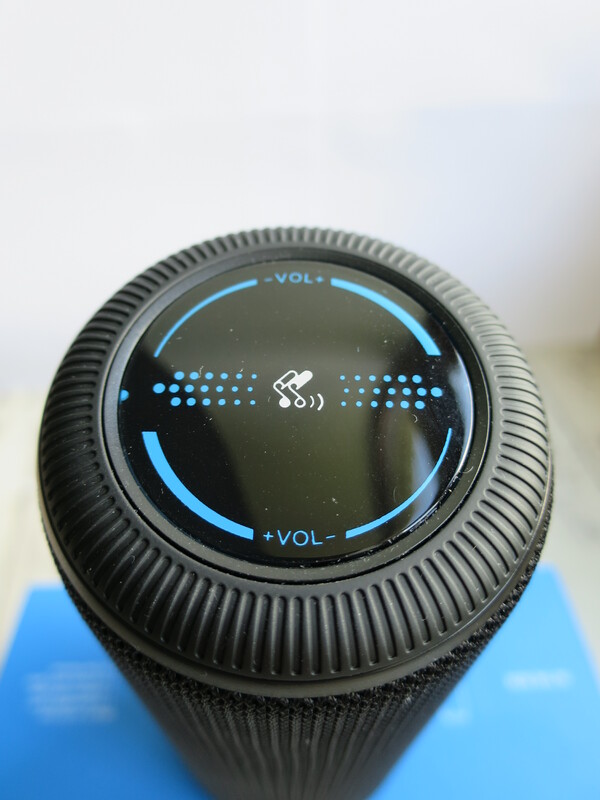 This allows encrypted communication between both parties. On OSX/ OS Sierra you can use the free & open source GPG Suite to install the tools required to start encrypting email. The suite includes the GPG keychain which allows you to create your key-pair for your email address, and it also allows you to store the public keys of your recipients & to upload your public keys to public key servers. It allows you to manage & store your keys. Also in GPG suite you have GPG mail which integrates with the native mac mail client. Much of the encryption process is automated once you setup your keypair, including downloading the keys of recipients you address your emails to. You can also sign your emails with GPG Mail which confirms your email as authentic to the recipient. First, install GPGsuite using the .DMG file available on their website. 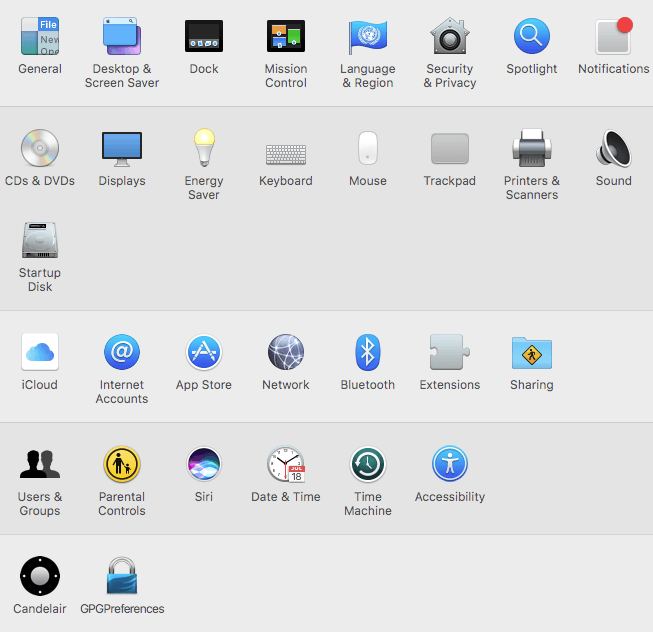 If you are using Sierra or require cutting edge enhancements, opt for the beta package. Once installed you will have an extra option in your settings preference pane called GPG Preferences. 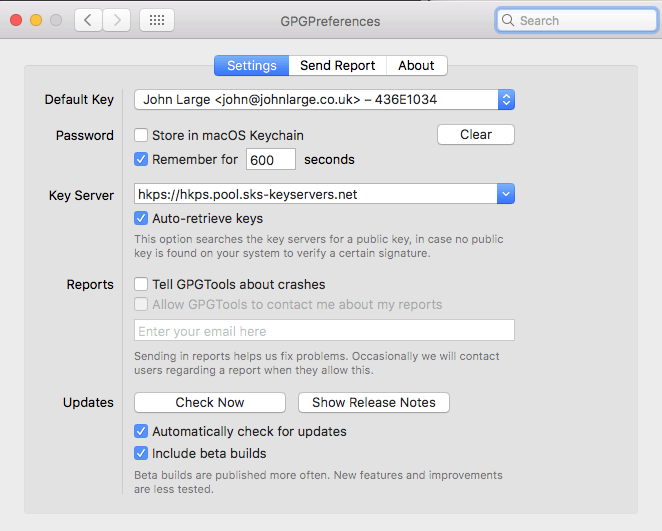 This allows you to set your GPG preferences, such as update checking and the public keyserver you would like to use. Most people can just leave this set with the default values. 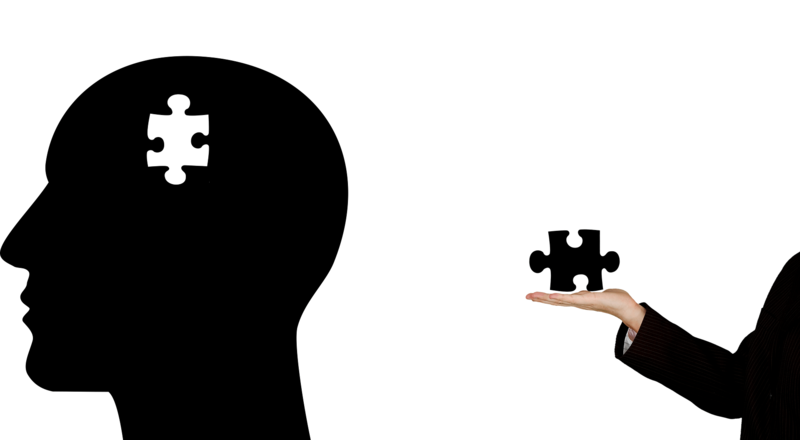 The first thing you will want to set up are your keypairs. Make sure you have added the email account you want to start using with encryption as one of your Mac Mail accounts. If you use a free account such as Gmail you can still add it to your Mac Mail software & encrypt emails using that account. Next, head to your applications folder & select the newly installed GPG keychain application. Open the application and click New in the top left corner. You will be presented with the following screen, showing you your Mac Mail email addresses. In these settings, select the email account you would like to use with GPG encryption, select the box to upload your public key (makes it much easier for people to correspond with you) and enter your passphrase. The passphrase is a vital part of your encryption as it unlocks your keypair for use. Make sure it is a strong password & one you can remember. Also, my advice is to use a password you only use for encryption. This password is never for use with any online services such as websites. A single hack of any of those sites could reveal your password, so encryption passwords are only for local use. Once you are happy with your passphrase, click generate key. Your GPG key pair will be generated & public key uploaded to they keyservers. You should then see your newly created key within GPG Keychain. You are now good to start creating encrypted emails. My advice, if you are going to start encrypting emails between friends, family or colleagues is to first send them an email with your public key attached. This way, they can import it into their keychain to allow them to email you. They can also send you theirs back. This isn’t a requirement if you have both uploaded them to a keyserver, but it’s always a good idea before you start encrypting communications between you. It’s also a friendly way to allow the other party to know that you want to encrypt your emails & to expect future emails to be encrypted. Now, fire up Mac Mail and compose a new email, you will see a new OpenPGP option in the top right of your compose window. This will be green if using an email account for which you have created a keypair & will be greyed out if composing from an account without a keypair. In the screenshot below I’m emailing between my own account & my unused gmail account which also has a keypair. As you can see the OpenPGP button is green which means a keypair is present & I can encrypt on this account. You will also see in the above screenshot the two blue icons. They are blue if they are enabled, but are greyed out if either a public key isn’t present for your recipient or you have opted not to encrypt. If you do have a public key for your recipient in your GPG Keychain you can activate one or both of these buttons. The left one which is a padlock is your encryption button, the right one is your GPG signature to securely sign your email. If sending to someone with whom you have a public key, I would always sign & encrypt. 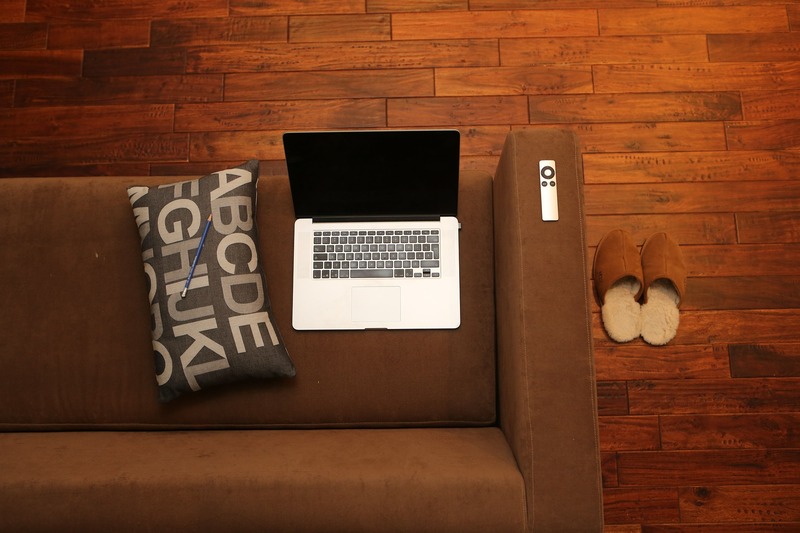 Once you are setup, emailing is just as straightforward as before. Write your message, your subject and add any attachments you would like. Note that only the body of the email is encrypted, the subject line is not so be careful what you use there as it is publicly viewable. Once you are ready you can hit send, at this point you will be given an OpenGPG prompt for your pass phrase. This is your encryption pass phrase which you setup at the time of creating your key pair. This password will be required every time you encrypt or decrypt an email. You can opt to save the pass phrase in your keychain but I would advise against that. The whole point of encryption is to make email for your eyes only (and your recipient of course) so keep the passphrase to yourself & commit it to memory. It’s just good practice. The last part of the puzzle is decrypting email. Below is a screenshot I took of the email I just sent between my two accounts. 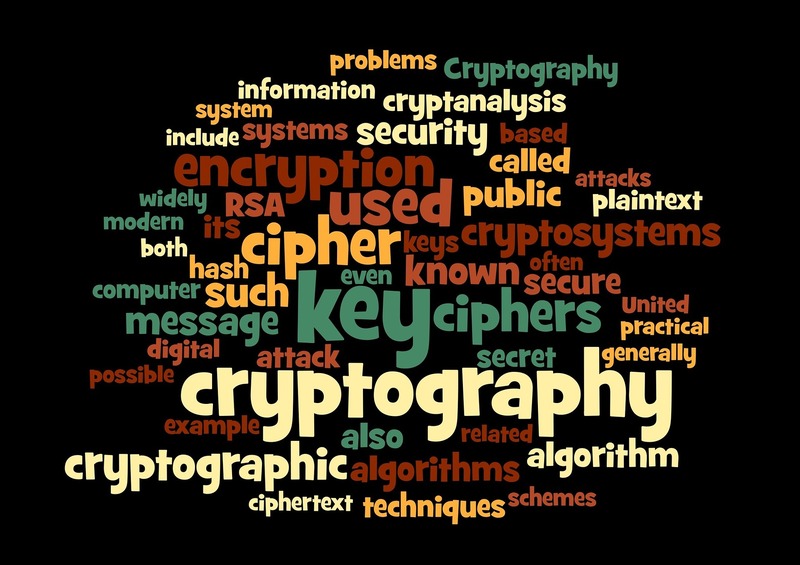 When opening the email you will be asked for your encryption passphrase, this is to unlock your own keypair to decrypt the email. You will see from the screenshot that the email looks like any other, with the exception that it has signature and encryption details. The padlock shows that the email is encrypted. If you follow these steps you will ensure any correspondence sent between you & your friends/family can’t be read by any third-party. This means that if your email account is hacked, the contents of your messages remain private. Perfect for family photos, private information and general personal chatter. It also means that companies such as google can’t read your emails for advertising & data collection purposes. The message remains scrambled with encryption across the whole internet, no matter who intercepts it. Once you get used to this process it will become second nature. I like the ‘at rest’ security of encrypted emails. I’m less worried about personal emails being hacked or stolen in a data grab. If my server is compromised, my emails are not. I also like the fact that using a completely unique password for my encryption means that my encryption password is never in the wild online. I’ve committed a complex password to memory & I’m not likely to forget it after typing it so many times. No security is perfect, but this is by far the biggest bang for your buck with regards securing your communications on a day-to-day basis. You must keep your key pair secure. You can back them up using GPG keychain, both your public & private key, but you must keep them safe. Never put your secret (private) key online or into cloud storage. If you ever lose control of your keypair, someone could pose as you and send emails masquerading as you, not to mention decrypt emails if they guess your passphrase. GPG Keychain has the ability to revoke keys if you feel they have been compromised. You can then generate a new keypair & upload to keyservers as required. This is just a brief outline of how to get started with OpenPGP using GPGSuite. If you would like to know more, you can read up online. A good starting point is the GPGtools site itself. 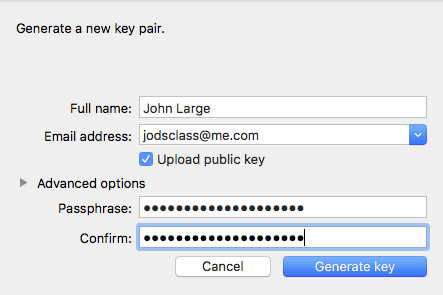 If you would like to send your first encrypted email, drop me a message at john AT johnlarge.co.uk using my public key which you can retrieve from the keyservers or download by clicking here. If you want to add to this post or correct please do let me know, like my other cybersecurity posts I’ve kept it as simple and non technical as possible to make it accessible. The post will evolve over time. I often find myself in cities & on trips without access to an outlet & I can be down to 50% before 10AM. I use my iPhone to conduct my business, manage my life, listen to music & take photos. 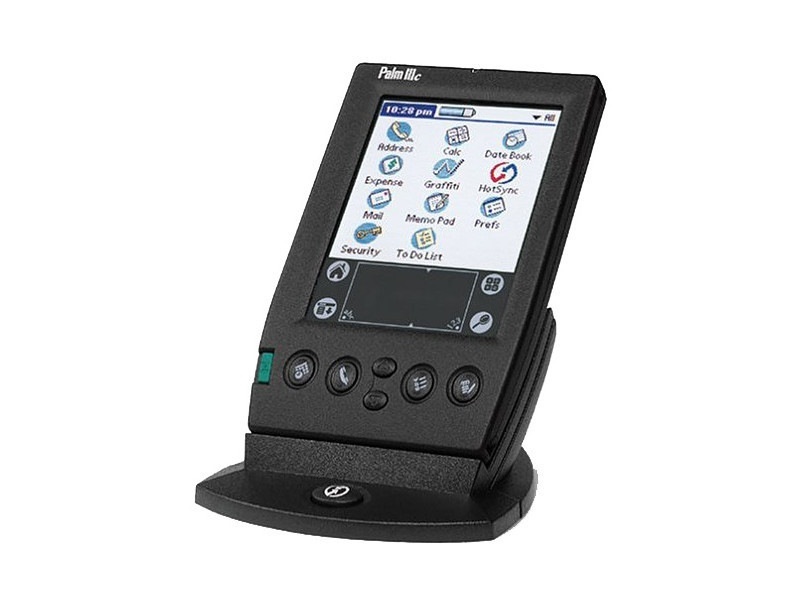 I use it to pay for coffee, to organise meeting friends & reply to business emails on the go. I use it a lot. I don’t tend to kill time with the iPhone, I’m not a Facebook user and tend to limit my social media usage, but I still struggle to maintain battery life. I was excited when Apple introduced their low power mode, but I’ve mostly found it useless as it manages to save very little power. In the past I’ve used low quality power banks. I had a cheap one from Primark which would give me around a 50% charge on the iPhone 6. I’ve also resorted to dropping into Apple stores in Liverpool, Manchester, London, Amsterdam & San Fransisco on my travels to replace the display iPhones with my own to sneak a charge. It would be handy if Apple provided charging bays at tables for this very purpose. Anyway, after all of the road warrior action I decided to address the problem. A power outlet isn’t always available. You find them in places like Starbucks, but they normally have someone tethered to them for the long haul. I therefore opted for a high-capacity power bank. 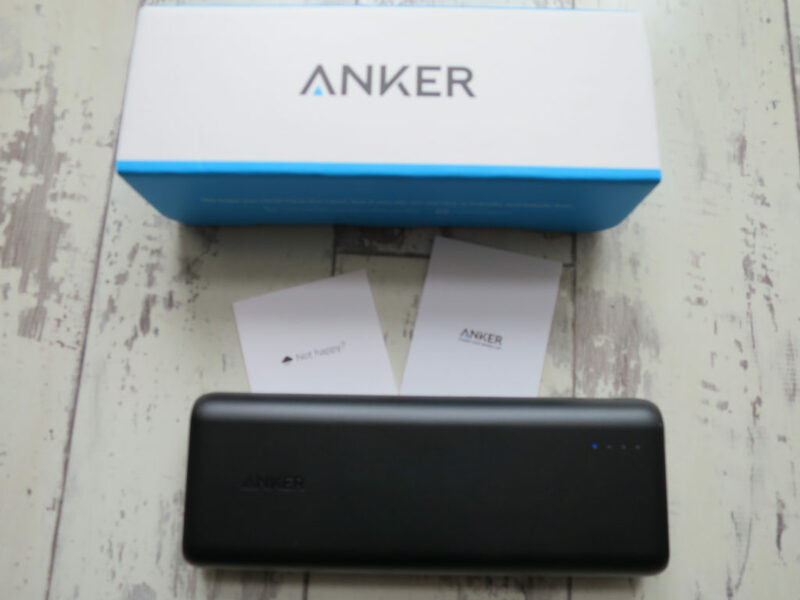 After a search & reading plenty of reviews I decided to buy the Anker PowerCore 20100 power bank from Amazon. It is currently reduced from £59.99 to £29.99 so it is an absolute bargain. This is a 20,000mAH battery pack and I’ve found it can keep my iPhone 6 charged for an entire week. 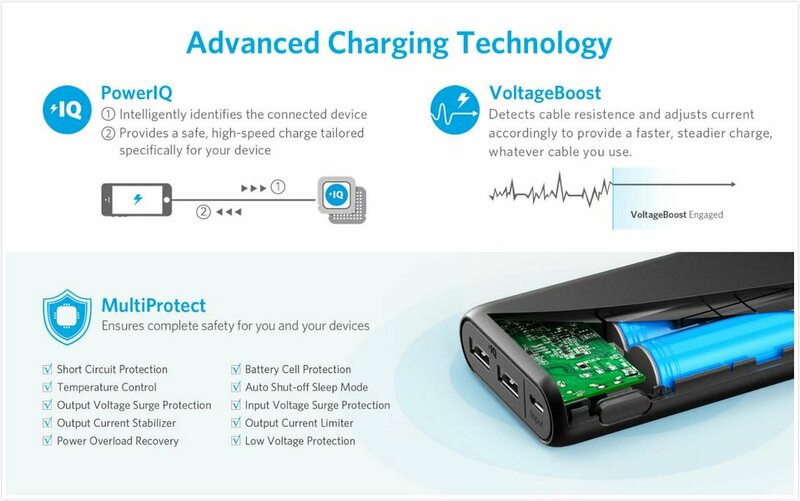 The power bank itself takes a while to charge on a standard USB port or USB charger. I’ve been using my high-capacity 12w iPad charger to charge the power bank much more quickly & find an overnight charge will fill the power bank. 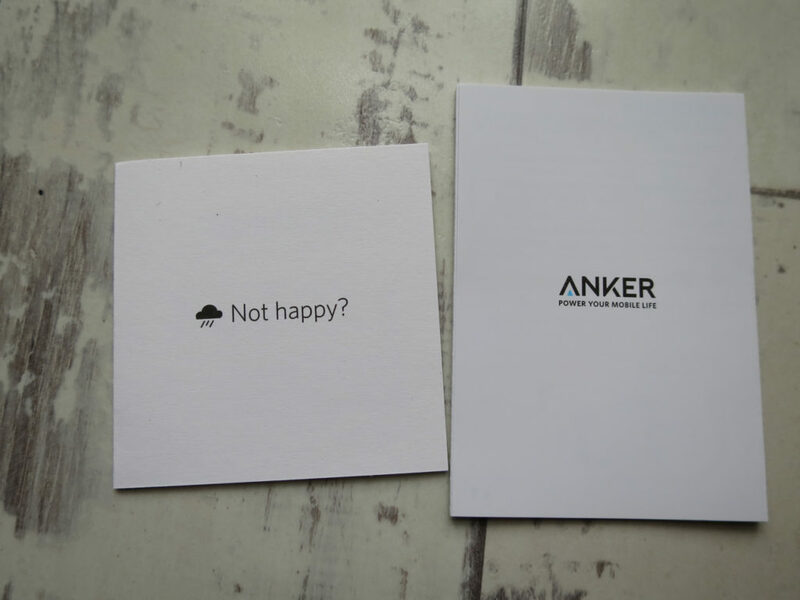 I do like Anker products, the build quality is second to none & the quality in general of their products is superb. I prefer to buy once & buy well & this fits the bill. It’s made from sturdy, rugged plastic and is quite heavy. 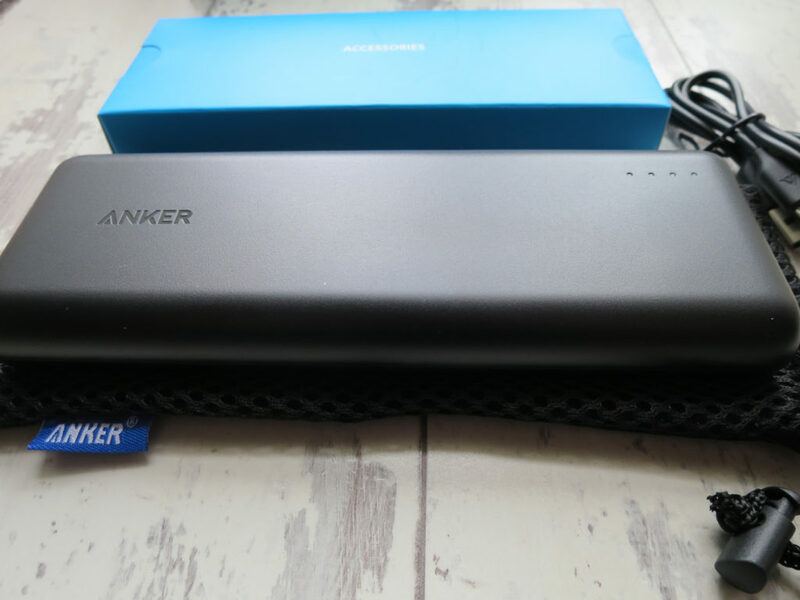 It has a charge indicator button and four small blue LED’s to show you the current charge level of the power bank, much like that found on Macbook’s. 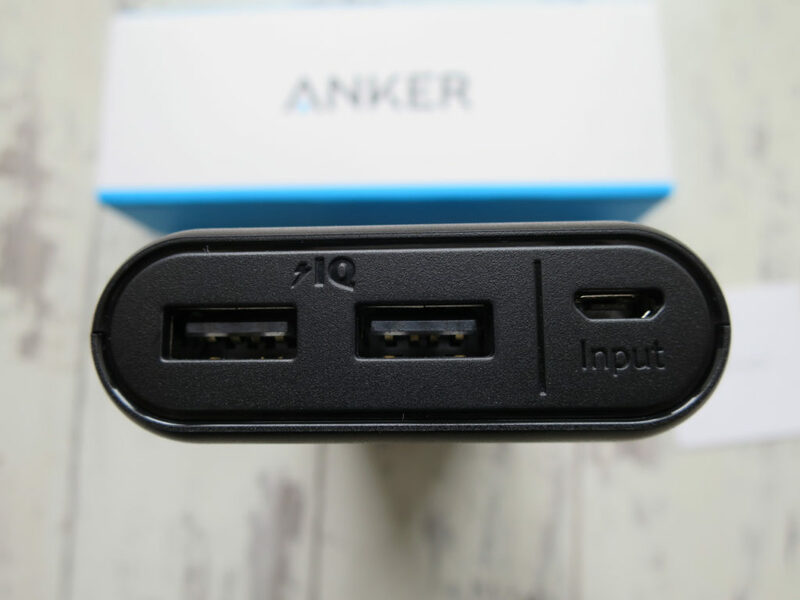 This particular model has a single micro usb input for charging (with the supplied cable) and two standard USB outputs for charging any USB device. 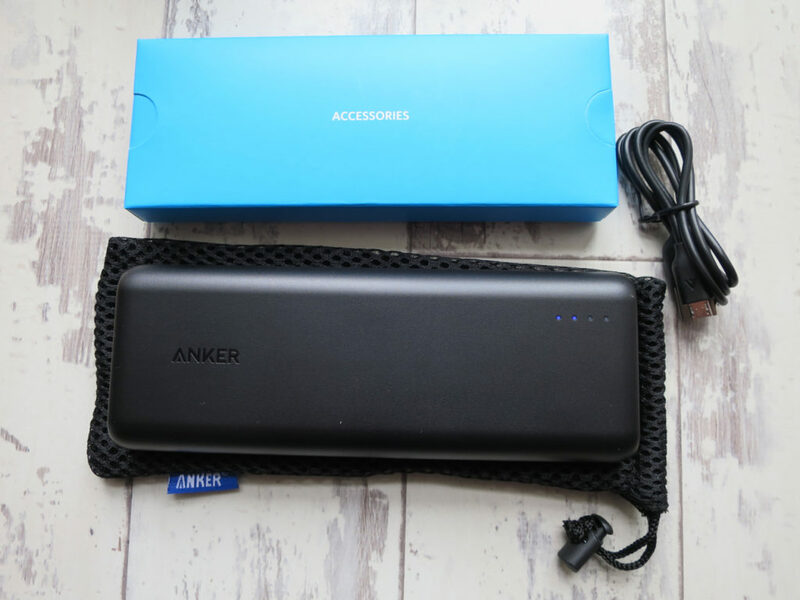 The Power Bank also comes in a great padded sleeve with a draw cord, which is perfect for travelling & throwing into your backpack. The Anker PowerCore 20100 can charge two devices at the same time & I find it charges my iPhone 6 as quickly as a mains adapter. On a recent trip, it managed to keep my iPhone 6 charged for an entire week, which is crazy. 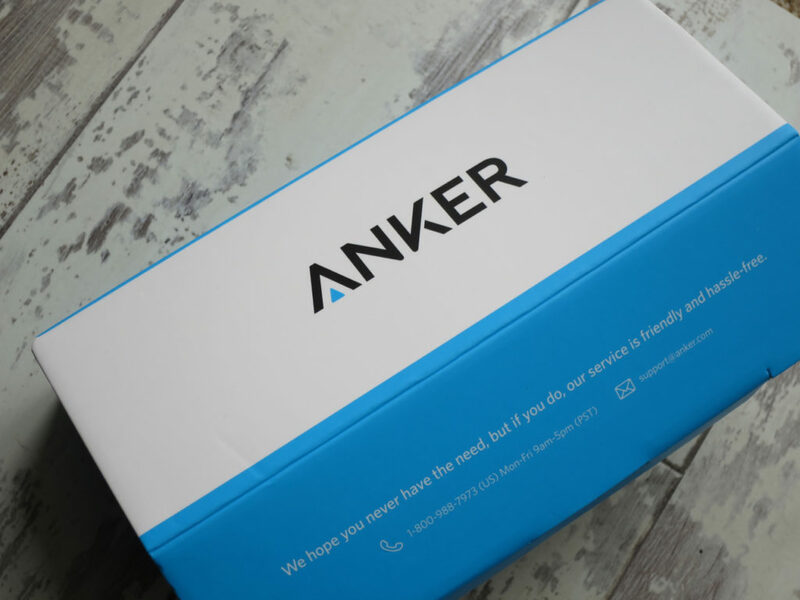 The Anker PowerCore 20100 can output 4.8 amps and features something they call Power IQ technology, which optimizes charging based on the device it is charging & can rapid charge supported devices. I feel more confident using a device like this over a generic one as I trust the quality of the cells used & trust it won’t burst into flames or fry my devices. I also found this is the maximum capacity I would go for as anything larger can been troublesome when it comes to airport security & carry on luggage. There is a limit on the size of lithium-ion batteries that can be taken on a plane without scrutiny, so to save the hassle I went with an acceptable battery capacity. Finally the packaging. 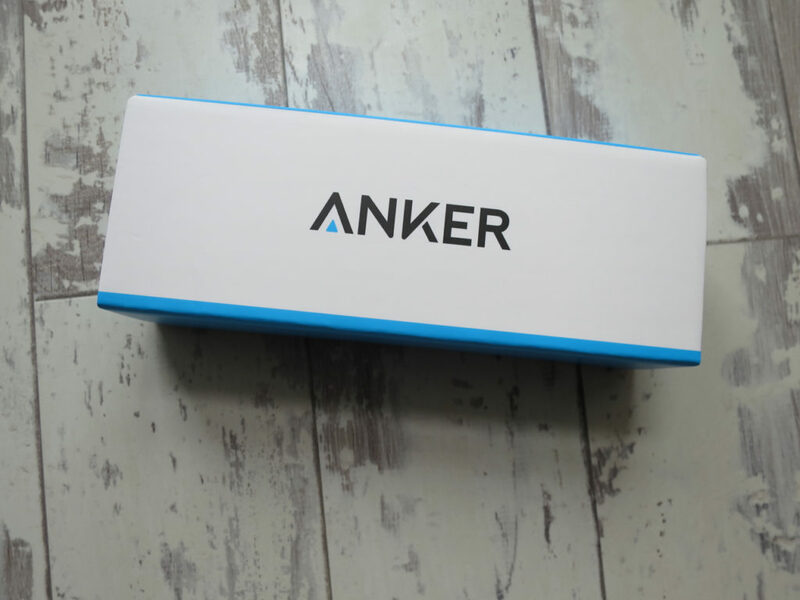 I’m a bit of a packaging geek & Anker satisfied my geekiness. The packaging is wonderful & even feels nice. You can see just how good the packaging is in the pictures below. If you use your smart phone or tablet on the go I would recommend you go & grab one of these before the price increases. It has become a staple in my everyday carry & always sites fully charged in my backpack. No more hunting for sockets. I’ve also been able to bail out friends when their devices have died. Do you use a power bank? Let me know which ones you use & your experience with them. In the days pokémon Go it would appear more & more people rely on them to keep their devices charged. It would seem over the past 6 months or so, development of OpenELEC and support for OpenELEC has wound down. Maybe the developers have other projects to focus on, but I found that it wasn’t being updated as often as I would like. I then spotted LibreELEC which is operated by a small board of developers focused on creating a system with just enough OS for Kodi. This is excellent news for anyone running Kodi on a Raspberry Pi as the filesystem requirements are small & only enough processes & services run in order to support Kodi, meaning precious resources are freed up on slower hardware. It would appear LibreELEC is based on OpenELEC and the filesystem appears to be very similar. The update procedure also appears to be identical. To upgrade to LibreELEC, I downloaded the latest release from the Libreelec website and selected the “Manual Update from OpenELEC” .tar file. 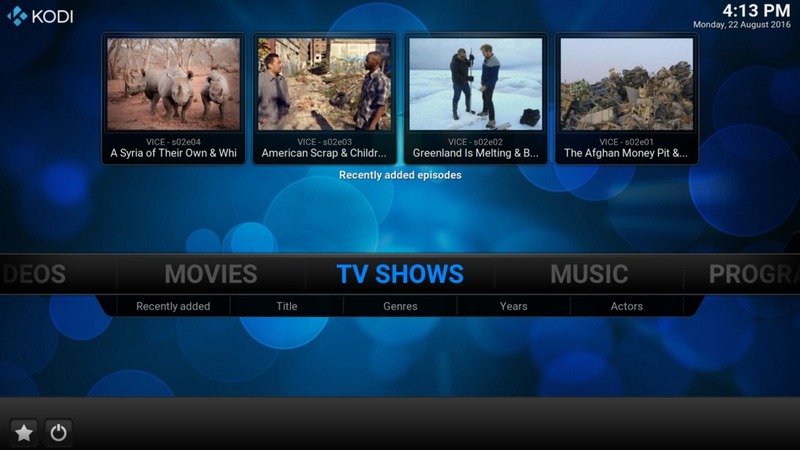 Once downloaded, open up your OpenELEC shared folder on the network and place the .tar in the update directory. Once you have done that, reboot the Pi and LibreELEC will install in place of OpenELEC. And with that my Raspberry Pi 2 which is a dedicated media centre was upgraded to LibreELEC. I’ve actually found that the libreELEC install is very stable, and my uptime has been constant since the update. I’m currently running Kodi 16.1 Jarvis and this media centre experiences very heavy usage in our household. LibreELEC is going through constant development, so if you still use OpenELEC I would recommend updating. Also, it’s nice to get the latest versions of kodi Stable when they are available. I’ve not had any issues with LibreELEC and it works very well with my raspberry Pi 2. I’ve also found that HEVC x.265 hi def content actually plays on the latest version of Kodi running on LibreELEC. I struggled to get those high resolution/compression files playing on OpenELEC without dropping a lot of frames and jerky playback. LibreELEC and Kodi 16.1 Jarvis seem to handle them perfectly now on my Raspbery pi 2 media centre. 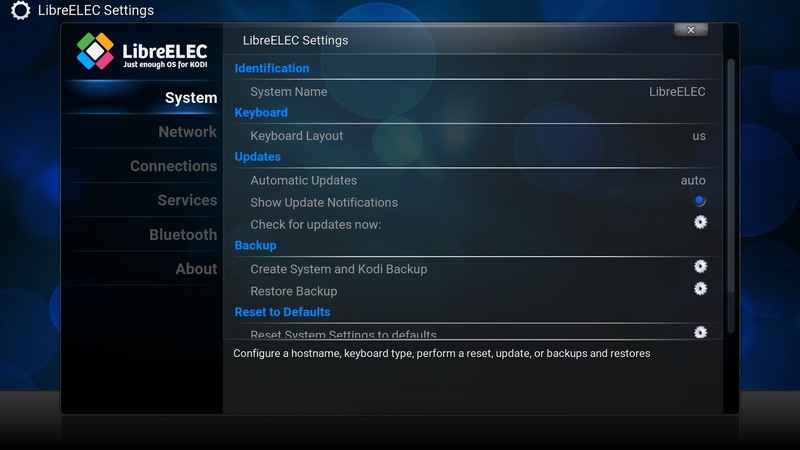 LibreELEC has an almost identical extra configuration menu to that offered in OpenELEC, allowing you to manage wifi connections and stop/start services. It also has a handy little event viewer which allows you to view basic system logs. May come in handy when debugging issues int he future, but so far it has been rock solid so I’ve not needed to use it. LibreELEC now powers our living Room media centre. This is the only TV we have in the house, as we tend to use Computers in other rooms or Laptops with kodi installed. But as our main media centre it is excellent. I’ve yet to find a format that libreELEC and the Raspbery pi 2 can’t handle, and even streaming over wi-fi on our internal network, we haven’t experienced any issues. Have you upgraded to LibreELEC? if so let me know how you are getting on with it in the comments below. The laptop itself is still fairly powerful for an older laptop with an Intel® Core™2 Duo CPU P8600 @ 2.40GHz dual core processor and upgraded ram to 4GB it really is a good mobile workhorse. I only paid £50 for the laptop in September & I installed 4GB of ram I had in my desk drawer from an old Macbook upgrade. I also updated the Intel wifi board to an Atheros to allow me to run Trisquel. Last month however the original Lenovo battery finally died. The battery light on the x200 was flashing orange and as soon as I unplugged the power adapter the laptop would power down instantly. I hit the forums & read that this is common with older batteries in the thinkpad’s. Apparently they have a fuse in them & when a cell starts to die, varying the voltage across them, the fuse burns out and shorts the battery. This seemed to be the case so I hit the Internet to weigh up my options. 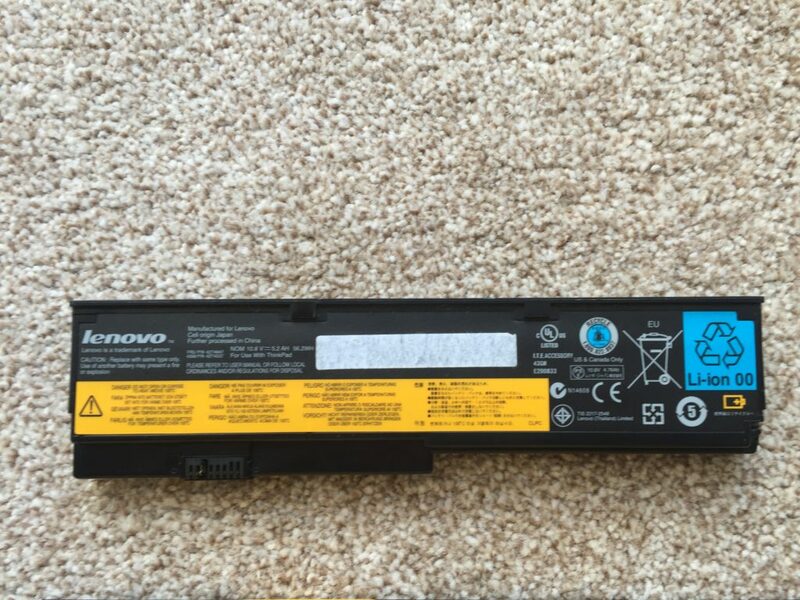 An original 5200mah battery manufactured by lenovo was coming in at around £70. This didn’t seem like a great option considering I only paid £50 for the laptop. I was adamant that I didn’t want to buy a used battery as the history of the battery & the life remaining is such an unknown, but I definitely wasn’t going to spend so much on an original Lenovo battery. I found various sellers on eBay & amazon & decided to opt for a higher capacity 7800mah battery. These have a larger form factor & stick out of the back of the laptop, but apparently they can run the X200 for an extended period of time, so I thought it would be a good option. The battery was also cheap at £23 including delivery. On receipt of the battery it was quite obvious that it was a cheap & nasty product. It had a small crack in the flimsy plastic case, the locking button was stiff and the copper pins of the battery looked like a dog had been chewing them. 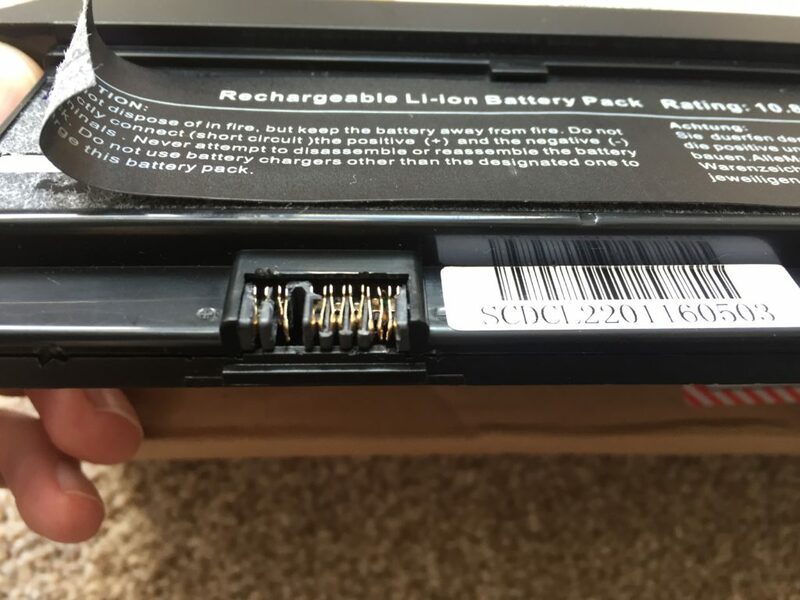 I tested the battery to see if this was just cosmetic, but when plugging the battery in i found that they battery would run the laptop, but would not charge & wasn’t even being detected by the X200 charging circuits. For all intents & purposes, the laptop didn’t know a battery was present & also couldn’t give any indication of charge levels or discharge rates. I contacted the seller who must have known this is a common problem as he refunded the order, without question or return. I was disappointed but relieved to have the refund. I then decided to head to Amazon. I was determined to find a cheaper third-party battery & decided to look for an item which was held in Amazon stock & dispatched by them. This way, if any problems arose I would be dealing with amazon for a return and not a third-party seller. 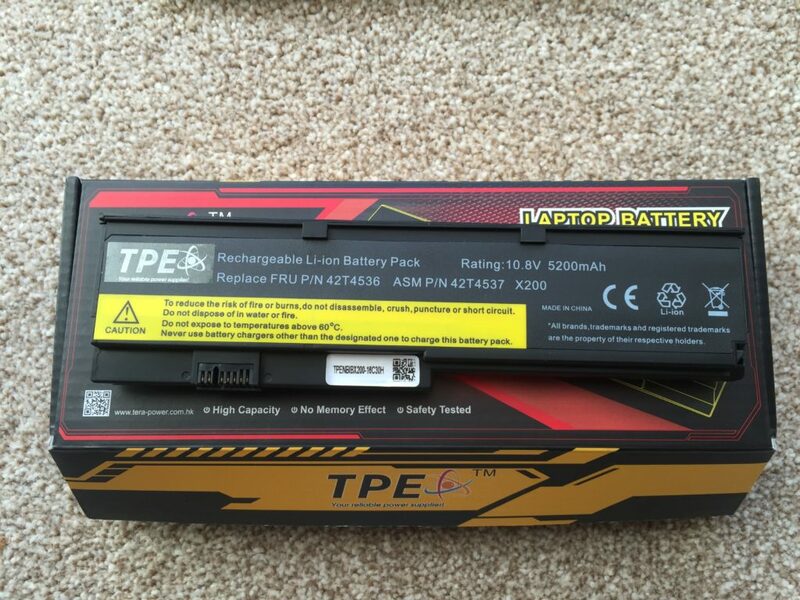 I found the battery supplied by a company called TPE. Another third-party brand I had never heard of, but a brand none the less. They had a website & lots of safety certification. They also seemed to have positive reviews so I decided to order from them. This battery was a 5200mah battery which was the same spec as the original Lenovo. I decided to go for this one as I prefer the flush fitting of the standard battery over the extended life battery I tried previously. 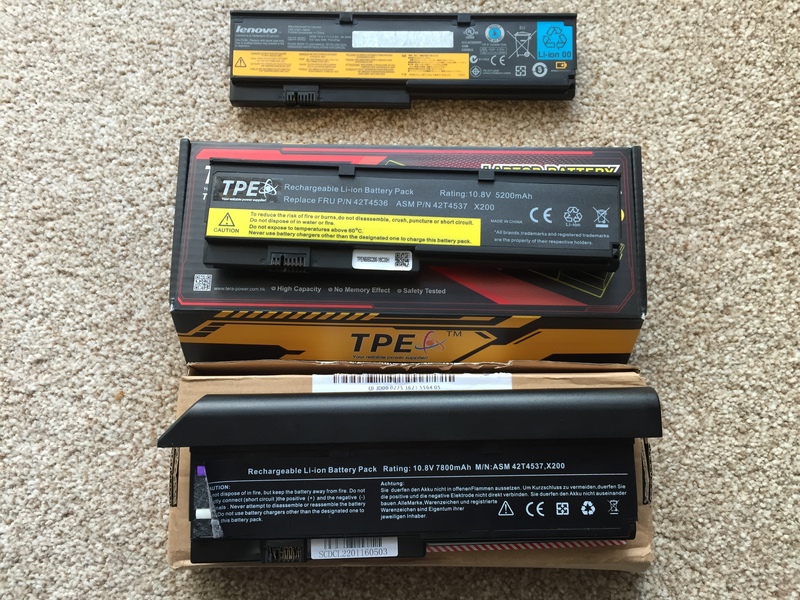 The TPE X200 battery came within a week and again cost me £23. This one was 100% better. 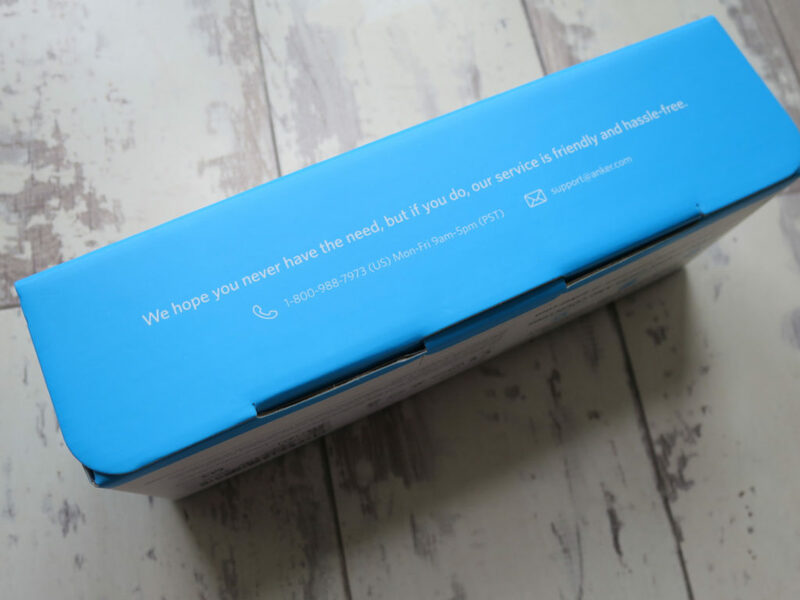 Nicely packaged, perfect anti-static, decent quality casing & stickers & the copper pins where perfect. I plugged it into the X200 and instantly I was running off battery. It was 78% charged and the X200 on trisquel was showing 3 hours of battery life remaining. Modern lithium-ion batteries are less prone to memory effect than older laptop batteries but I always run new batteries in nicely. It’s a habit now. So I ran on battery until it was critically low & then gave it a full charge. I’ve got to say, I have no complaints with the battery. After a few full cycles it’s holding excellent charge & giving me almost 4 hours without using any specific power tweaks on Trisquel. This TPE battery seems comparable in quality to the original Lenovo battery & I would highly recommend you have a search on Amazon if you need to update or replace yours. 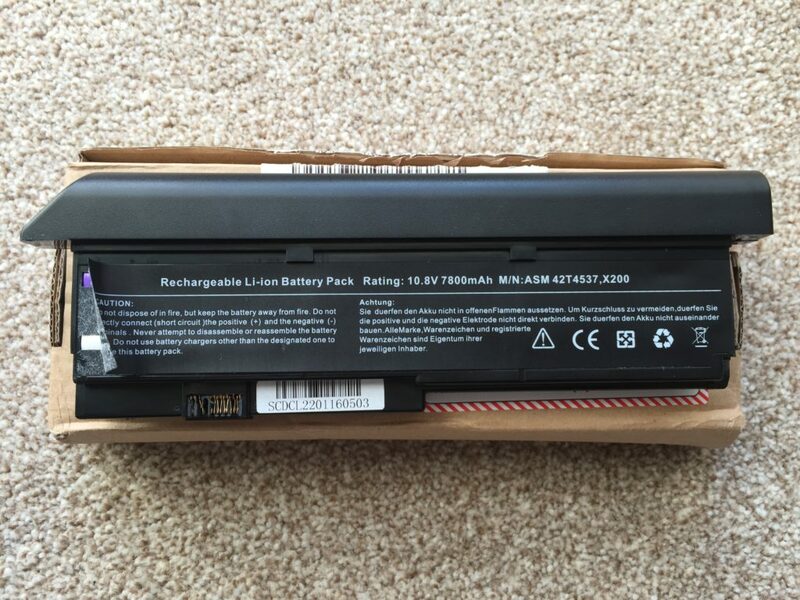 The X200 takes battery part number FRU P/N 42T4647 or ASM P/N 42T4537 as standard so search for those part numbers if you want to replace your original X200 5200mah battery.